Panda Cloud Antivirus 1.5 launched today by Panda Security, the cloud security company. Panda Cloud Antivirus is easy to use, light, secure and 100% free. This new release includes performance improvements as well as new features suggested by the product’s user community. 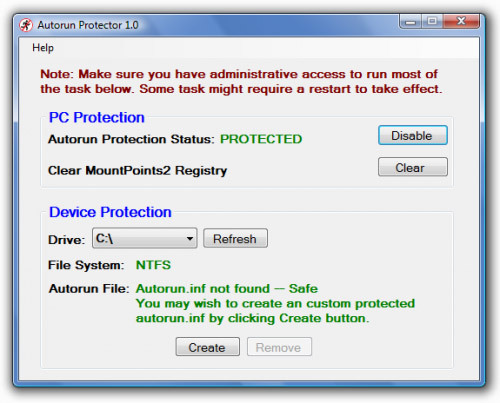 To automatically open Pen Drives or flash drives Windows Operating Systems uses AUTORUN.INF file. When we insert USB drives we get a dialog box asking for user action. Well, this feature is quite good but users face a lot of problems when virus enter their USB drives. The virus enters the pen drive whenever the USB is plugged into the PC. So, to prevent opening of AUTORUN.INF file here are top 9 free tools for you. Address Guard is a powerful feature of Yahoo Mail Plus. It protects your primary email addresses from spam by creating disposable email addresses. You can use the disposable email addresses when you don’t want to share your primary address with everyone.